Biocidin is a blend of herbs that is an essential natural medicine to mix with Lyme disease prescription or herbal antibiotics, such as Otoba Bark Extract and Cat’s Claw. It may even inhibit or kill Lyme on its own as a nutritional support. may also support treatment of intestinal parasites. Biocidin’s ingredients include: bilberry extract (25 percent anthocyanosides), noni, milk thistle, echinacea (purpurea and angustifolia), goldenseal, shiitake, white willow (bark), garlic, grapeseed extract (minimum 90 percent polyphenols), black walnut (hull and leaf), raspberry, fumitory, gentian, tea tree oil, galbanum oil, lavender oil (plant and flower), oregano oil (plant and flower). how to successfully use it in a Lyme disease treatment. This video was recorded during our free weekly Lyme Q&A Webinar Series called Conversations with Marty Ross MD in December 2017 when Dr. Ross practiced in Seattle, Washington. Learn more or sign up for the next one here. There are four main reasons to use Biocidin as a nutritional support in Lyme disease. See the references at the end of this article for research supporting these claims. Biofilms block Lyme treatments. They are sugar slime layers held together in a protein skeleton that germs develop to hide from the immune system and to resist antibiotics. A number of studies show Lyme germs create biofilms and this is one reason the disease is hard to treat. 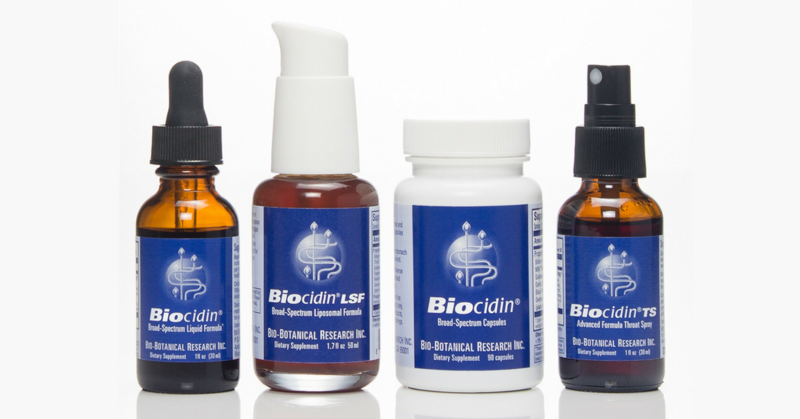 In research studies, the botanicals in Biocidin effectively weaken and eliminate biofilms in a number of ways. One way is by preventing germs from sticking to surfaces; another is to block quorum sensing where germs in biofilms talk to each other making the germs and biofilm stronger. Germs in biofilms use efflux pumps that flush antibiotics out; research suggest many ingredients in Biocidin may block these pumps. Finally, several ingredients in Biocidin may limit germ swarming motility where some bacteria develop tails to rapidly spread. Learn more about biofilms and other effective treatments in Biofilms: Lyme Disease Gated Communities. As I mentioned above, bacteria in biofilms pump antibiotics out. Several ingredients of Biocidin may block these efflux pumps, which weakens biofilms. More importantly, however, this could prevent the removal of other antibiotics like doxycycline and Biaxin, which need to build up inside germs to kill them. Thus, using Biocidin in combination with some intracellular antibiotics, such as the tetracyclines, macrolides (Biaxin and Zithromax), and quinolones (Cipro and Levaquin), may help them work stronger, as it limits one form of antibiotic resistance. In vitro laboratory experiments show spirochetes and cyst forms of Lyme are reduced or eliminated when exposed to various concentrations of Biocidin. Some of the herbs in Biocidin are potentially bacteriostatic which means they work by limiting the growth of the germ. Some are potentially bactericidal which means they work by directly killing the germ. These laboratory experiments suggest usefulness as a nutritional support. During a Lyme treatment with prescriptions and herbal antibiotics, the risk of intestinal yeast overgrowth increases. When it occurs, this condition can cause a devastating decline in health. In addition, at the beginning of treatment many people already suffer from this condition, thereby adding to the burden of chronic Lyme disease. The herbs in Biocidin are shown to reduce or eliminate yeast and to remove yeast biofilms in laboratory experiments. To read more about yeast, see A Silent Problem. Do You Have Yeast? Biocidin’s ingredients work together in a synergistic way to create the most benefit. Here are the proposed ways Biocidin works. May Assist the Immune System. Shiitake and echinacea may boost the immune system based on research. For instance, Shiitake mushrooms in Biocidin improves the function of cells that fight infections as it boosts TH1 immunity. Limits Quorum Sensing. Through quorum sensing germs communicate to becoming stronger and to form biofilms. Also, the biofilms they form then become stronger. Garlic, oregano, and goldenseal found in Biocidin may limit quorum sensing. Stops Biofilms Sticking to Surfaces. Raspberry, thyme, lavender, oregano, and tea tree oils found in Biocidin can limit biofilm adherence or sticking to surfaces. Blocks Efflux Pumps. Black walnut, garlic, goldenseal, and raspberry found in Biocidin may limit germ antibiotic resistance. They can help block efflux pumps that remove herbal and prescription antibiotics from cells. Limits Germ Swarming Motility. Bilberry and grape seed extract may decrease swarming where some bacteria grow tails to swim and rapidly spread. Stops Germ Growth (Bacteriostatic Herbs). Echinacea, goldenseal, gentian, and shiitake mushroom found in Biocidin may limit the ability of Lyme to grow. Kills Germs Directly (Bactericidal Herbs). Biocidin contains volatile oils like lavender, oregano, and tea tree that research shows are naturally antimicrobial. Bilberry, black walnut, garlic, gentian, grape seed, olive leaf, and shiitake mushrooms are also bactericidal. At the beginning of treatment and throughout care. Three months into herbal or prescription antibiotic treatment. My experience in chronic Lyme disease treatment shows that by three months of treatment, 30 percent of people have improvement. Generally, these people have an easier chance recovering from Lyme disease with traditional herbal and prescription antibiotic combinations. For those who are not having significant changes by three months, then consider adding Biocidin because it may help remove biofilms and decrease antibiotic resistance by blocking efflux pumps that remove antibiotics from germs. Intestinal dysbiosis caused by yeast, sibo, or parasites. Use Biocidin for people who have a disturbance in the healthy makeup of bacteria that live in the intestines. This is called dysbiosis. It can occur from yeast overgrowth in the intestines, parasites picked up from well water or international travel, or bacteria growing in the small intestines, which should not be there and is called small intestine bowel overgrowth (SIBO). Common symptoms of these conditions include gassiness, bloating, constipation, or loose stools. Because Biocidin can help kill yeast, unhealthy bacteria, and parasites, sometimes used in my Seattle practice without fully testing for the germs that lead to dysbiosis, if the symptoms are obvious. Basically, Biocidin can help in the clearance of many causes of dysbiosis. For more information about yeast treatments, see Kills Yeast: A Brief Guide. For more information about treatments for intestinal parasites, see When & How to Treat Parasites in Lyme Disease. Some people at the end of treatment, use low-dose prescription antibiotics or herbal antibiotics to prevent relapse. This can police the environment. Biocidin is useful in this situation because it seems to boost the immune system, helps eliminate biofilms, supports removal of germs, and does not lead to yeast overgrowth in the intestines. For further discussion about relapse and relapse prevention at the end of treatment, see Finished? And How to Prevent Relapse. As a single antibiotic regimen for Lyme disease. Laboratory experiments at The University of Jyväskylä, Finland, showed the herbs in Biocidin killed the various forms and life cycle stages of Lyme and eliminated biofilms. As such it may work on its own to kill Lyme. Based on these laboratory bench experiments, I added Biocidin as a stand-alone support supplement. My patients reported decreased symptoms from this addition. For other antibiotic herbal and prescription antibiotic options, see A Lyme Disease Antibiotic Guide. Biocidin LSF. Start at 1 pump under the tongue 1 time a day. Every 2 days increase by 1 pump first as 1 pump 2 times a day, then 1 pump 3 times a day, and eventually to 2 pumps 3 times a day. If you develop a Herxheimer die-off reaction, do not increase until it passes. For sensitive people, place 1 pump in 5 ounces of water. Start with 1 ounce 1 time a day. Increase by 1 ounce a day, increasing gradually at first to 1 ounce 3 times a day. Eventually, as tolerated, work up to 10 ounces (2 pumps) 3 times a day. Liposomal means the Biocidin ingredients are microscopically wrapped in sunflower oil. This may allow for better absorption into the brain which is higher in fats than other tissues. Based on research, it also appears that the liposomal form concentrates more strongly in germs and cells than the non-liposomal form as the intracellular absorption is improved. Biocidin Liquid. Start at 2 drops on the tongue 3 times a day and increase every other day by 1 drop per dose till you reach 10 drops 3 times a day. If you develop a Herxheimer die-off reaction, do not increase until it passes. Take without food by taking more than 30 minutes before food and more than 2 hours after food. Biocidin Capsules. Start at 1 capsule 2 times a day and after 2 days increase to 1 capsule 3 times a day. Every 2 days add 1 capsule till you take 2 capsules 3 times a day. If you develop a Herxheimer die-off reaction, do not increase until it passes. Take without food by taking more than 30 minutes before food and more than 2 hours after food. Humphreys C. Biocidin Research Update – The Science Behind the Success. YouTube. https://www.youtube.com/watch?time_continue=32&v=j3s_vf2p4dI. Accessed September 19, 2018. Lewis D. SIBO: Herbal Therapy is an Effective Treatment for Small Intestinal Bacterial Overgrowth (SIBO). A Clinical Research Update. YouTube. https://www.youtube.com/watch?v=ur3Q-FYmuh0. Accessed September 19, 2018. Fresco R. Biocidin: Clinical Protocols for Dysbiosis and Biofilms. YouTube. https://www.youtube.com/watch?v=OY_1F7bx9AA. Accessed September 19, 2018. Gilbert, L. (2016). Preliminary Report on Activity of Biocidin against Borrelia Species (Rep.). University of Jyväskylä, Biological and Environmental Science Dept. Marques C. Activity of Biocidin against biofilms microbial biofilms. Unpublished manuscript of research conducted by Dr. Marques provided through personal communication with Rachel Fresco, LAc, PhD.